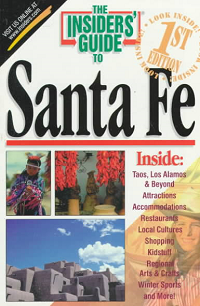 Published in 1998 and updated in 2000, An Insider's Guide is a welcome and needed instruction booklet for all things Santa Fe. The city different was founded in 1608, and Hillerman deftly parses out the history of Indigenous, Mexican, and Anglo influences that contributed to the cultural capital of the region as a "confluence of contradictions." The area boasts pit houses and community plazas that are more than eight centuries old. Local culture, lodging options, museums, nightlife, sports, shopping, festivals, kid-focused fun, and the natural environment have dedicated chapters. Activities in nearby Taos and Los Alamos are included. Although the intro jests that the handbook cannot be exhaustive because that is what phone books are for, it is today's precise absence of phone books that makes this manual so necessary. Great to keep in the car, purse or pack for inspiration when the need arises.